Bali island Admire the beauty of Balinese paintings make home tastefully, Bali with breath taking natural beauty recognized by anyone who has ever visited into a medium that inspired the artists hands good hands of Bali itself or from another artist to create a work that is not less beautiful, the artist seems to never run out of ideas and imagination for exploration, that's why one of the Bali Island created many beautiful high quality art such as the art of dance, sculpture, various craft that was born from the artisans in Bali. All About Bali The resulting painting Balinese artists have long been known to connoisseurs of art the art of painting in the international produce has a characteristic with bright colors in the color images, with almost the same object, motives natural beauty, dancer of Bali motif, a motif traditional ceremony, bird and animal motifs in Bali such as chicken which is a typical objects originating from the island of Bali into a plural object contained beautiful above the fabric of the canvas.Bali woow. Discuss the Bali talks about the beauty of both the beauty of the work of the Lord in the form of natural charm or beauty created by the work of man, the nuances of the beauty of Bali is always there in every corner of the city, the Balinese paintings can be found easily at home house, lodging, hotel, shop art gallery of fancy and expensive until sold into the streets even at the sea side. 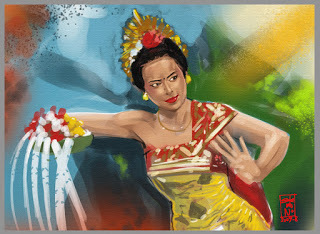 The painting became a very worthy for you to make the gift by the time visiting Bali, such as in Bali, where nearly all the places in beautiful paintings decorate by Balinese, the beauty of it could also be on the move to a room in your home, decorating painting of Bali will make art and artistic impression of a room. Large selection of Bali painting theme can you choose, painting with a classic style with a more natural color strokes by blending beautiful motives about the culture and customs in Bali, or paintings of natural beauty with beaches or rice field that was still green or also the painting of a woman's eye highlight sharpness of Balinese living up to the meaning of a story him dancing, with the characteristic strength of the visible colors of life painting the painting is worth to you presents at home to commemorate the beauty Bali the island of gods. All about Bali island.